Historians Hebe Mattos and Martha Abreu published an excellent article on their weblog (it is in Portuguese and featured on this website in the menu Digital initiatives) about the new heritage trail of Valongo Wharf, in Rio de Janeiro, Brazil. Hebe and Martha as many of you know are pioneers (along with the late Ana Lugão Rios) in the study of the oral history of descendants of slaves in the Paraíba River Valley (southeast Brazil), an endeavor that previous Brazilian historians did not have the courage to carry on. As I have been studying and writing about this question and the Valongo Wharf (among others) is among the historical sites that I examine in my latest book , I write here some thoughts about the issue. More than two decades ago, old slave ports were transformed into recognized sites of memory and some of them official historical sites of the Atlantic slave trade (listed in UNESCO World Heritage List). In West Africa, the most famous sites are certainly the castles along Ghana’s coast and also those in the coastal areas of Republic of Benin, which were the object of several initiatives developed during the 1990s e later supported by UNESCO. This wave of memorialization and promotion of the public memory of slavery and the slave trade also arrived in other former slave ports as Bristol and Liverpool in England, as well as Nantes and Bordeaux, in France. In these cities, the work of historians like Éric Saugera and Christine Chivallon were accompanied by the activities of local associations gathering members of the black communities of these cities who mobilized themselves to develop heritage trails connecting the sites of memory associated with the Atlantic slave trade. Probably the most famous of these heritage trails is located in Bristol (England): “The Slave Trade Trail around Central Bristol.” Created in the 1990s, it was followed by other initiatives like the trail London, Sugar and Slavery, unveiled as part of an homonymous permanent exhibition that opened in the Museum of London Docklands in 2007, during the commemoration of the abolition of the British slave trade. Today, even in Paris, there is a black history heritage trail for those interested in this topic, even though this trail is not famous as the previous ones. Unfortunately, although being the blackest country of the Americas, this tendency arrived very late in Brazil. Actually, only in the last five years. When I conducted research and wrote my book Public Memory of Slavery: Victims and Perpetrators in the South Atlantic between 2004 and 2010, there were very few monuments and permanent markers related to the history of the slavery and the Atlantic slave trade in the country. To many colleague historians, my criticism of the absence of these markers was not justified, as black history and the history of slavery were everywhere in the country, then there was no need of permanent markers and monuments. To give you an idea, the famous (and up to now the only) significant Brazilian museum dedicated to black history (the AfroBrasil Museum), was unveiled only in 2005. The first monument honoring Zumbi of Palmares (leader of Brazil’s largest and long-lasting runaway slave community) was unveiled in the black capital Salvador, only in 2008. But as expected, this situation started changing in the middle of the years 2000, more than then ten years after the initiatives developed in West Africa. Even the scholars, previously pessimistic regarding this issue, started seeing the need to bring the history of slavery to the public space. Porto Alegre, for example, a capital city that is eccentric in regard to other important Brazilian touristic centers like Salvador and Rio de Janeiro, has since 2011 an official heritage trail, called Black Route Museum. Florianópolis, the capital of the state Santa Catarina in the South of Brazil, has also a similar initiative titled Santa Afro Catarina. In the case of Porto Alegre, like in Bristol, the initiative was led by local black organizations and was eventually officially recognized by the city that embraced the project along with other organizations, including UNESCO. 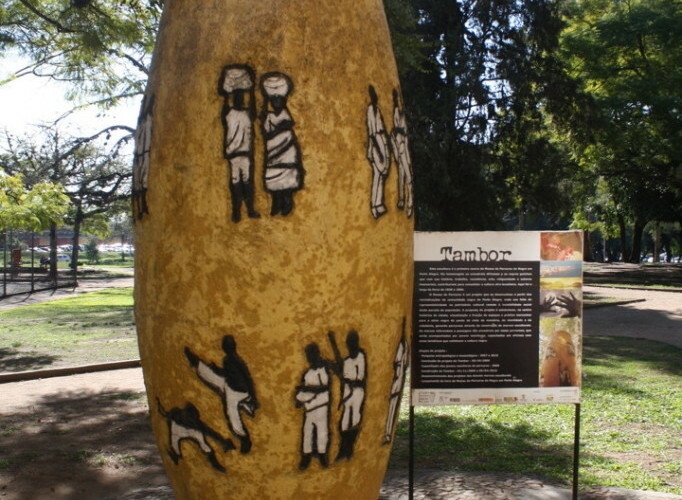 Today, when walking in Porto Alegre, visitors and residents can see the permanent markers highlighting the site of the Gallows Square where enslaved men and women were hanged and where today is displayed an explanatory plaque along with a great sculpture representing a drum. In addition there are markers in the Public Market, and a huge “African footprint” at Alfândega Square, signalizing these sites of memory. In the case of Rio de Janeiro this process also arrived very late. The city, of course, already had a number of initiatives here and there, like the small and old Black’s Museum in the Alfândega Square, which was created in the twentieth century by the Catholic black lay brotherhood of Our Lady of Rosary and Saint Benedict of the Black Men. But when in the 1990s, the Cemetery of New Blacks was discovered near the city’s port zone, the authorities’ reaction was rather silence. Fortunately, this context began to change in 2011 with the “discovery” of the Valongo Wharf in the port area of Rio de Janeiro. Even though everyone (including academics) knew about its possible existence, as the cemetery’s uncover in the previous decade already indicated. Then it is with great pleasure to know that the wave of memorialization of slavery of that began in the 1990s in various parts of the world has finally come to Brazil. With the creation of permanent markers, that wounded memory and heritage which remained invisible is now part of a narrative that gradually becomes official. Let’s see what comes next. * a version in Portuguese of this article was posted last year on my personal website. This is essentially the same text, with some updates. ← A New “Slavery” Museum in the United States ?